We talk frequently about customer service on this blog and in conjunction with our software solutions -- with good reason. There can be a fine line between customer retention and customer attrition, and it is one expensive line for service organizations. 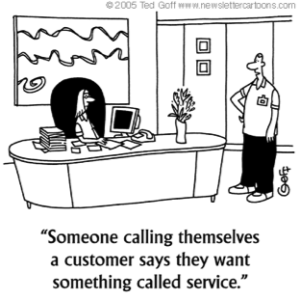 In fact, analysts from Genesys report that poor customer service results in estimated $83 billion loss per year. Additionally, 89% of consumers began doing business with a competitor due to a poor customer service experience (Oracle Customer Experience Impact Report). With these statistics, does it surprise you to read that last year (2013), 40% of the Customer Service Hall of Shame by MSN money, were field service organizations? What gives? Words will only get you so far. According to Flavio Martins, a service expert and blogger, many service organizations fall into the trap of not practicing what they preach. They emphasize customer service in mission statements, taglines, and more, but don’t actually deliver on their promises. In fact, according to Accenture, 80% of companies believe they deliver “superior customer service” but only 8% of their customers agreed with them. Mr. Fix-It: Executing on promises starts with understanding your customers’ needs and wants so you can deliver accordingly. Start with following up with customers. Provide your customers with customer surveys, email, and social media outlets where they can engage with you and provide you with valuable feedback. Then you can adjust your mission, goals, priorities, and policies accordingly. Consumers tend to adopt new technology faster than businesses, and this affects communication as well as service delivery. The service industry is a competitive one, and consumers expect to be catered to. They are fickle, and with a multitude of choices available, they will often move on to the next provider if you don’t meet their needs. These days, customers would rather communicate with field techs and the customer service division of an organization through social media than traditional sources. According to Nielsen, over half of consumers now use social media to reach out to companies to report satisfaction, lodge complaints, and ask questions. Bain & Company also states that when companies engage and respond to customer service requests over social media, those customers end up spending 20% to 40% more with the company. Mr. Fix-It: Get on board with social media, mobility, chat apps, and more. Be as “HIP” with technology as your customers are. Follow the latest trends and conduct market research to help you deliver the up-to-date service with perks. Don’t be afraid to try something new. Customers love it and it will set you apart from the competition. Perhaps you are onboard with issues 1 &2, kudos to you. At the end of the day however, success often comes down to HOW something is delivered, and customer service is a perfect example of this. Sometimes, the issue is the method of delivery. Insert your field service management solution here. You may not have a solution, or you may have an in-house solution. Or you may have a basic solution that automates your scheduling, dispatch and other basic field service needs. Unfortunately, these solutions are not enough to delight customers. Why? Because they don’t help ensure your technicians arrive on time, they don’t help you provide narrow appointment windows, they don’t help you communicate with your techs or customers in the field, and they don’t help improve your first time fix rates. These are all things customers expect, if not demand. Mr. Fix-It: An optimized field service solution like those provided by ServicePower enable you to provide the BEST customer service to all your customers. Our scheduling product ServiceScheduling, powered by artificial intelligence algorithms, reduces your customer wait times by intelligently scheduling both technicians and parts to ensure the right tech with the right skills gets to the right place with the right equipment at the right time. Our mobile solution ServiceMobility allows technicians to stay in real-time communication with dispatch for on-site support and to provide the customer with a seamless experience from first touch to invoicing. Wow your customers by empowering your field service division to provide customers with a service experience that takes the stress and complexity out of the equation.